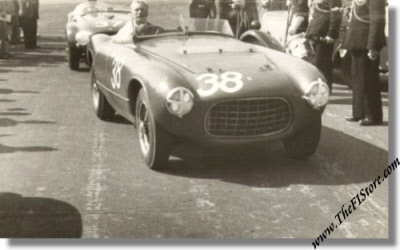 Vintage 1953 photo, Mike Hawthorn on Ferrari 340 MM S/N 0294AM, International Trophy Silverstone. This is a vintage 1953 photo of Mike Hawthorn and Tom Cole in their # 38 & 37 Ferrari 340MM's either before or after the 1953 International Trophy at Silverstone. The pair would finish the race in first and second place respectively. Both cars, S/N 0294AM, the 340 MM Touring Spyder of Mike Hawthorn and S/N 0284AM, the 340 MM Vignale Spyder of Tom Cole survive to this day albeit with completely different bodies so this is a rare opportunity to acquire a vintage photo of these cars in their original shape. The photo measures some 5 x 3 inches or 13 x 8 cm but is a little bit of an irregular cut. It carries NO copyright notices or photographer's name on the back and is in mint condition.